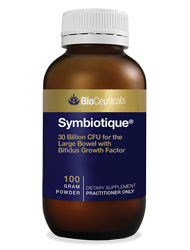 Symbiotique features a unique combination of lactobacillus, bifidobacteria, and the bifidogenic growth stimulant Propio-Fidus™ which further stimulates the intestinal growth of bifidobacteria. As a powder, Symbiotique is suitable for all age groups. Symbiotique is a combination of human strains of lactobacillus and bifidobacteria, with bifodogenic growth stimulant Propio-Fidus™. Provides 30 billion CFU per serve for internal flora balance. Features 15 billion CFU of the bifidogenic growth stimulant Propionibacterium freudenreichii (Propio-Fidus™) per serve. Powder form allows flexible dosing. Ingredients: maltodextrin, L. rhamnosus, P. freudenreichii, B. bifidum, antioxidant (ascorbic acid), B. longum. Mix 2 level scoops [enclosed] (3g) into your breakfast cereal, juice or water. Consume once or twice daily.